Groundscape Solutions, A Fort Worth Landscaping and Concrete Contractor, Designs and Installs a Concrete Patio for the city of Arlington. This Concrete Patio is hand scored and then each puzzle piece is then hand stained with different colors. This patio makes a great way to enter the building. 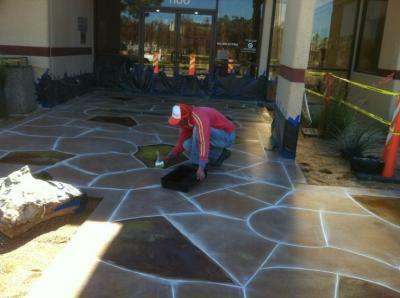 Concrete can be stained in a variety of colors and can be scored or stamped in a multitude of designs. Give us a call at 817-759-0102 for a quote and visit our website at www.groundscape.com Groundscape Solutions is a fully insured landscaping company and concrete contractor and will provide references.